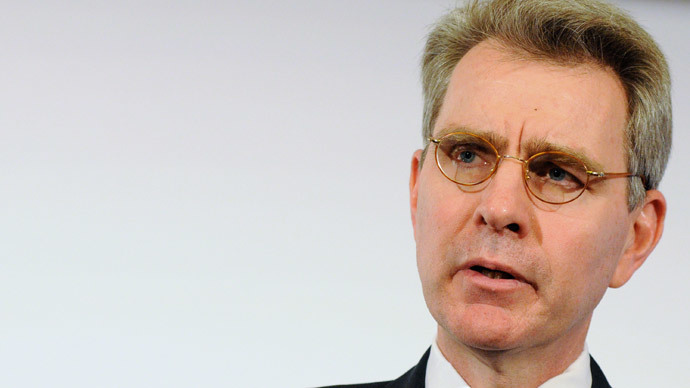 Ukraine has every chance of becoming a gas exporter again, as it was in the first half of the 20th century, said US Ambassador to Ukraine Geoffrey Pyatt. He added that the US will certainly help Kiev to achieve the goal. "Ukraine in fact had been exporting gas to Moscow and Minsk until 1950. Those exports amounted to about 70 billion cubic meters until the 1970s.This continued until the Siberian reserves of gas were explored,” the ambassador said at an oil and gas conference on Thursday, RIA Novosti reported. There is no reason why Ukraine can’t have the opportunity to do the same thing again, Pyatt added. The ambassador said he was sure investment would come from the US, and that the Ukrainian Parliament will adopt a law reducing the rental fee for the investors in gas extraction, which will help to attract American investment. Pyatt praised the government of Arseny Yatsenyuk for the progress in oil and gas and marked the United States’ support of the Ukraine’s gas sector, including the issue with price revision. The price of gas, electricity, heat and hot water were increased in the country on April 1. The average cost of gas in Ukraine rose by 285 percent to comply with the terms of the $17.5 billion aid agreement with the IMF. In January Ukraine signed a $2 billion loan guarantee deal with the United States. $1 billion of the financial aid was said to be allocated to Ukraine in the first quarter of 2015. Gas extraction in Ukraine amounted to 20.5 billion of cubic meters last year. In 2015 Ukraine is expected to consume 40 billion cubic meters of gas of which 25 billion of cubic meters will be imported, according to the government. Russia provided 39 percent of Ukraine’s gas needs in the first quarter of 2015; the rest 61 percent was supplied from Europe. Kiev buys natural gas from such large European gas suppliers such as RWE, Statoil, GDF Suez, E.ON, and Royal Dutch Shell. Ukraine imported 294.5 million cubic meters of gas from Russia in April. Kiev currently pays $247.18 per one thousand cubic meters of Russian gas which includes a $100 discount. The country gets gas from Russia on prepayment terms within a ‘summer package’ agreement signed by Gazprom and Naftogaz last month. In February, Ukraine’s Prime Minister Arseny Yatsenyuk called for increased domestic production of oil and gas and the implementation of reforms in the energy sector that could help Ukraine do without Russian gas.